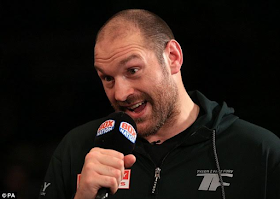 Home / Latest / “I can beat Anthony Joshua with one hand behind my back'- Tyson Fury brags. “I can beat Anthony Joshua with one hand behind my back'- Tyson Fury brags. Dethroned due to use of cocaine, former heavyweight champion Tyson Fury has claimed he'll defeat new WBO, IBF and IBO heavyweight champion of the world, Anthony Joshua with one hand behind his back, after Joshua called him out for a possible fight following his sensational 11th-round win of Wladimir Klitschko on Saturday night in a packed up Wembley stadium. after outboxing Wladimir Klitschko in Düsseldorf in November 2015 but was suspended from the sport last year after his blood samples tested positive for cocaine use. 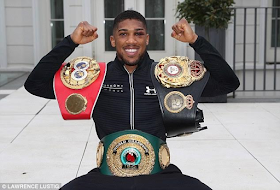 Now, Ring magazine, has given Fury the power to hold on to the heavyweight division’s No 1 status belt if he has a fight scheduled within 29 days, and Fury, 28, has now claimed he wouldn't only defeat Joshua with one hand behind his back but he wouldn't need to do a warm up before fighting Joshua, 27. Fury told Sky Sports: 'Styles do make fights but I am sure I can beat AJ with one arm tied behind my back. 'I don't even need a warm-up if he wants this, I have been out of the ring as long as Klitschko but the difference is, I am not 41, I am 28. 'AJ did really well to come back but I am not 41 or getting old. 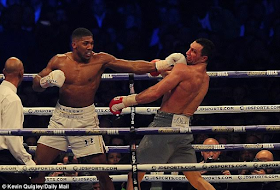 He is just a pumped-up weightlifter but [Klitschko] couldn't land one of those of those hooks on me, at all. 'It is a total clash of styles, a total clash of personalities, the complete opposites. I would just like to congratulate AJ for getting through the nip-and-tuck, life-and-death situation, against an old man, so well done. 'But let's face it, I am the man, the number one in the division. 'It was an excellent fight, very entertaining and enjoyable and I was screaming for AJ to smash him. 'I wonder what people would be saying today if Klitschko had done him in the sixth. I was screaming, pulling my hair out - or what little hair I've got left - because I was worried it would cost us millions! 'It is the only one the world wants to see and I am here, I am the lineal champion, I am still number one in the world and everybody knows that,' Fury added. 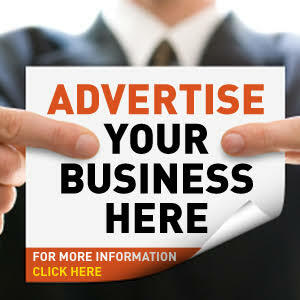 The British Boxing Board of Control could return Fury's boxing licence at a hearing next week making a lucrative fight between Joshua and Fury a huge possibility.